If visits from my parents were not enough on their own, they always come bearing gifts from their garden. On their most recent visit I was spoiled with fresh raspberries (my favorite! ), salsa, apples, plums, and heirloom tomatoes. The fruit was gone in an instant and I was left to ponder how to best use the tomatoes. Most people would just pop them in their mouths and a delicious snack, but I was itching to try a new recipe. 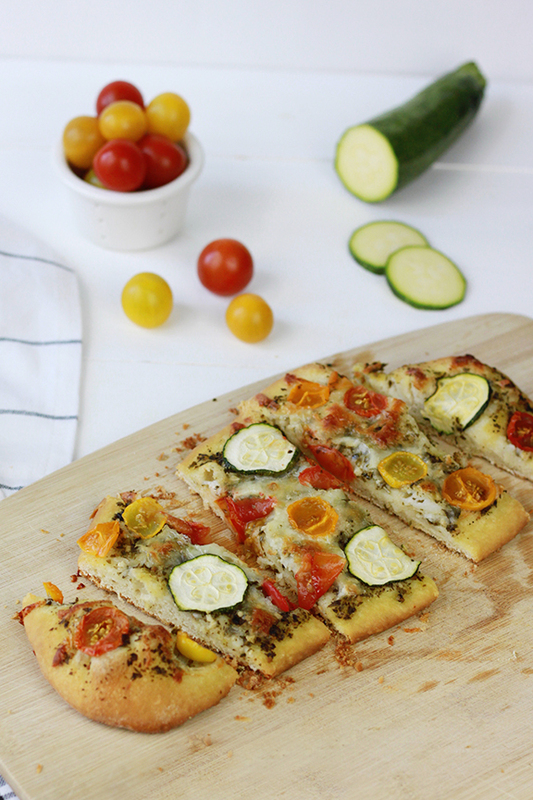 Therefore, I decided to whip up this heirloom tomato and zucchini pesto pizza with other ingredients I picked up for the farmer’s market. Ian has been dabbling with making homemade bread and pizza dough, but he was out of town when I attempted this recipe so I kept things simple and bought pre-made dough. After a few failed attempts at shaping the dough by tossing it in the air, I resorted to using a rolling pin. Thankfully, shaping the pizza dough was the toughest part of the entire recipe and everything else ran smoothly! Thirty minutes later, I pulled out the pizza, drizzled it with balsamic glaze and savored every bite. 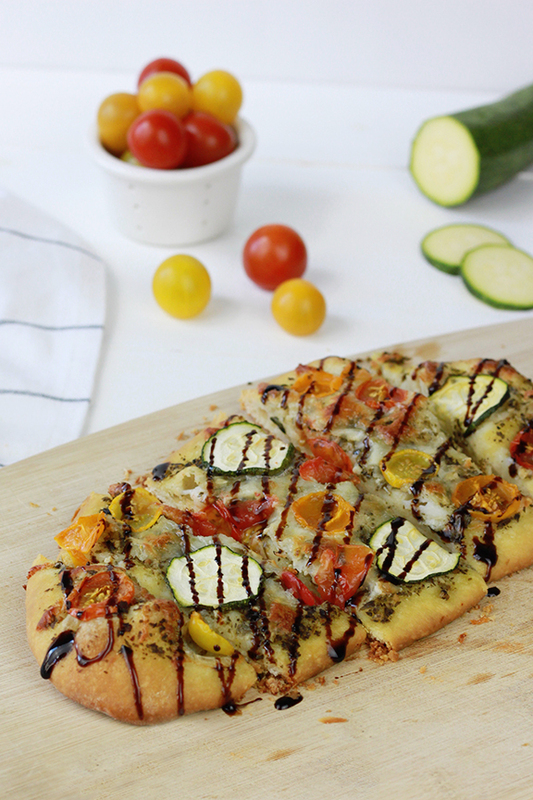 The best part about making a flatbread pizza is the flexibility to use what ever fresh produce you have on hand. 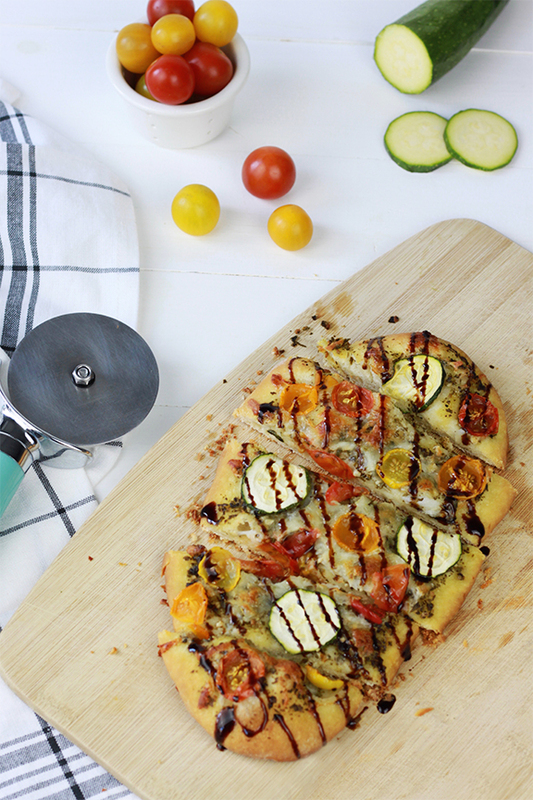 If you are throwing an outdoor BBQ you could take the recipe up a level and try grilling the pizza!